A male Eastern Tiger Swallowtail nectars on the Joe-Pye Weed flower. Image by Derek Stoner, 7/27/10. Every July, I eagerly anticipate the first blooms of one of the most impressive local wildflowers: the Joe-Pye Weed. A tall plant, often towering 8 to 10 feet high, this plant churns out pale pink flower clusters the size of human heads. Joe-Pye Weed (Eupatorium purpureum), is an amazing plant that is an herb, a wildflower, a butterfly plant and an ornamental for the flower bed. It’s named after a Native American herbalist, named Joe-Pye, who cured fevers using the Eupatorium plant. The flower’s attractiveness to butterflies is readily apparent now, as swarms of Eastern Tiger Swallowtails are congregating at the Joe-Pye juice bar. A male Eastern Tiger Swallowtail, wrinkled and showing signs of a rough emergence from the chrysalid stage. Image by Derek Stoner, 7/27/10. 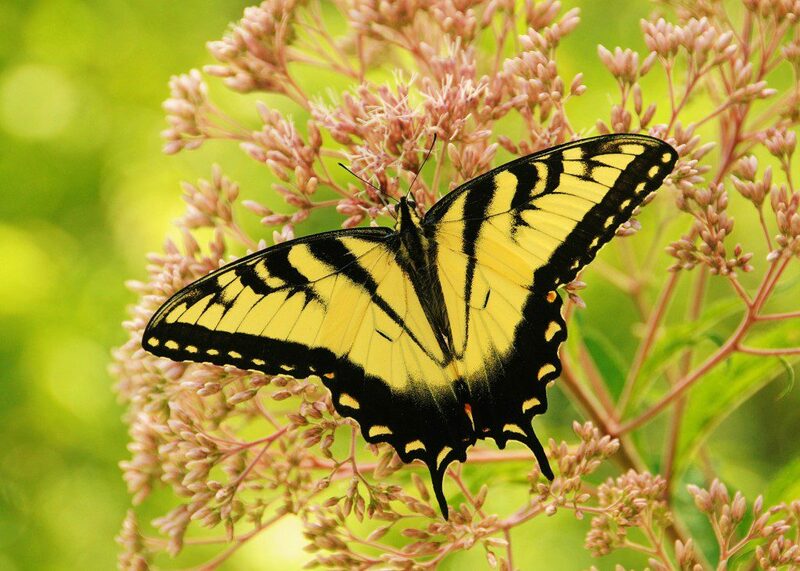 Tiger Swallowtails are the official state butterfly of Delaware, and are quite numerous in mid-summer. 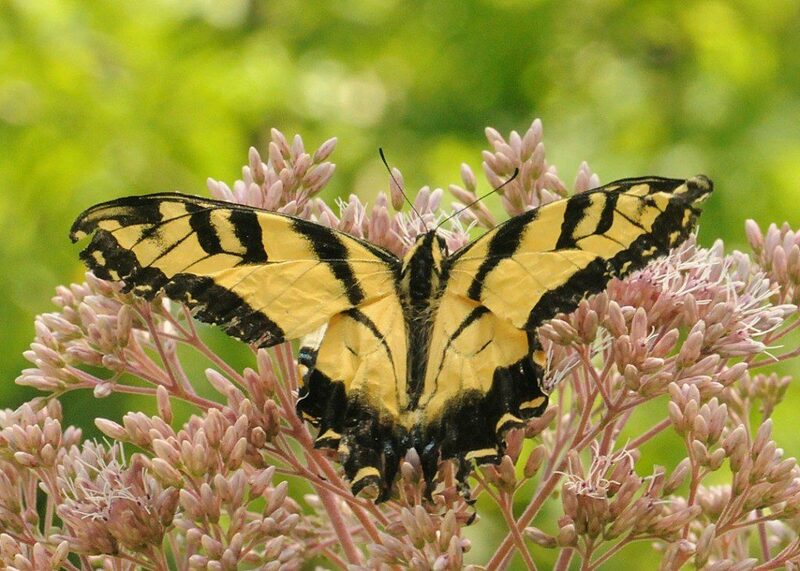 Their population is at its peak right now, and the best place to see them is on Joe-Pye Weed. Many of these flowers may be found along the floodplain at Ashland, as they prefer moist sandy soils. One of the best places to look is along the back corner of the parking lot near the recycling center, where there are large Joe-Pye stands that attract dozens of Tiger Swallowtails. After last summer’s cool and wet conditions made for low butterfly numbers, we are seeing a strong rebound of many species in our region. We are hearing reports of high numbers of Tiger Swallowtails, Red Admirals, Red-spotted Purples, and Viceroys in particular. What butterflies are you seeing in your backyard? If you would like to help with a special citizen science project, we invite you to join us for the annual Butterfly Count sponsored by the North American Butterfly Association. This year’s count will be held this Saturday, July 31, beginning at 9:00 a.m. Armed with nets, cameras, and notebooks, we will document all the butterflies we can find (and identify) at Ashland Nature Center and Burrows Run Preserve. To register for this free event, contact Sheila Vincent at 302-239-2334, ext. 125. 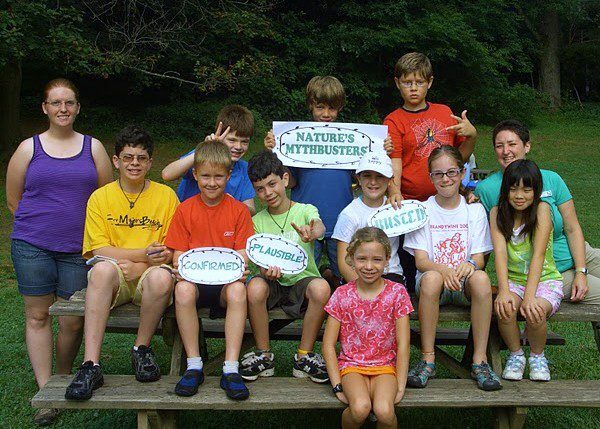 Eleven hearty campers in the Nature’s Mythbusters camp braved the heat and thunderstorms last week to determine the validity of some common nature myths. Our adventures took us off-trail and into the creeks in our quest for the truth. "Nature's Mythbusters" set out to "bust" common nature myths like "toads give you warts" and "if you touch a baby bird, the mother will reject it." Busted: moss always grows on the north side of trees. It does grow there, as well as on the south, east and west sides! So don’t count on it for directions if you’re lost. And none of the campers were surprised that we did NOT get warts from toads. Plausible: peppermint oil, hot sauce, and lemon juice seemed to keep the ant away from our picnic food. Yes, I said ant. Only one showed up for our experiment, but he clearly did not like those three things, so we deemed it plausible. Confirmed: Licking your finger to determine the wind direction proved to be an accurate method, wetlands DO protect towns from flooding, and humans DO affect the environment – in both positive and negative ways. Nature’s Mythbusters made a positive impact by cleaning up the beach area at Battery Park in New Castle. 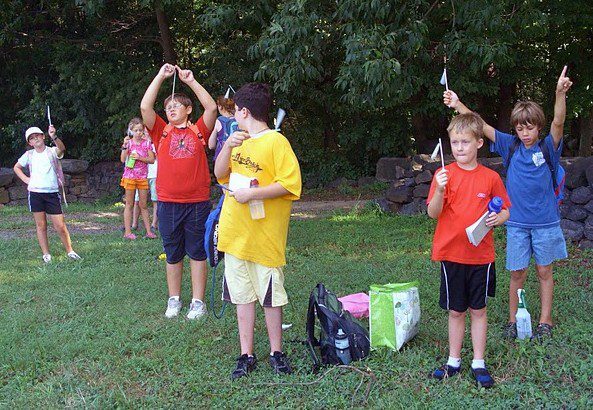 Testing the wind with homemade windsocks. But the favorite activity all week proved to be creating volcanoes. After all, it’s just not a true Mythbusters event unless something explodes! 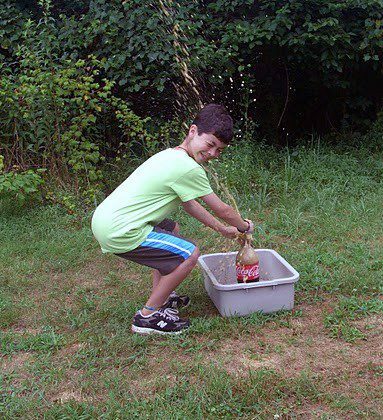 Josh ends up pretty sticky at the end of the week after dropping Mentos into soda. The Delaware Nature Society has had a long history of tracking Eastern Box Turtles at the Ashland Nature Center and Burrows Run Preserve. Jim White, Associate Director of Land and Biodiversity, has been marking Box Turtles here since the 1980’s by making small marks on the edges of their shells. Over the years, some of these turtles are relocated by trail hikers. 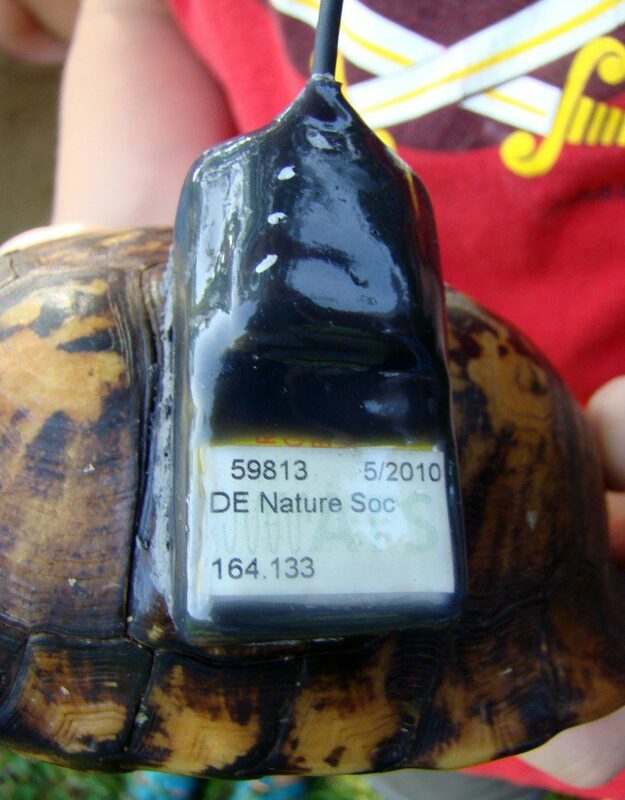 In 2004, the Delaware Nature Society tried a new method…tracking them by radio telemetry. This process requires that we attach a transmitter to the turtle’s shell. We relocate them whenever we want by using a special antenna and radio receiver. This week, a Box Turtle was found at Ashland Nature Center that bore Jim’s markings. Jim quickly looked up the turtle in his record-book. It was found on May 21, 1995, and since then in June of 1995, not again until May 5, 2006, and finally this week. That makes him well over 15 years old! Nate Nazdrowicz, a Herpetology doctoral student at University of Delaware who studied Box Turtles for his master’s degree, said that some Box Turtles have been found to live 100 years. Maybe this turtle isn’t so old in turtle years. Nate attached a transmitter to the turtle last night, and this morning it was ready for release. 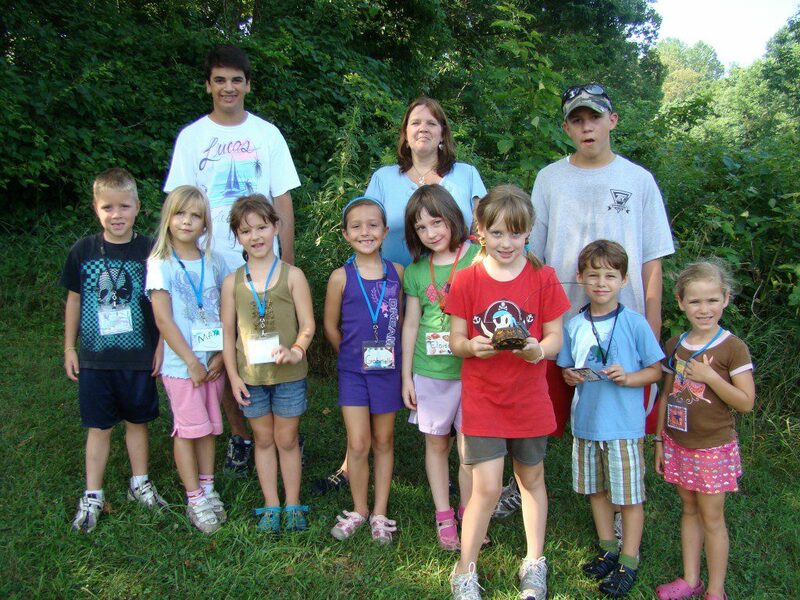 Since turtles have shells, and there is a Shell Sleuths camp at Ashland this week, we recruited the campers to help. First we had to weigh the turtle, measure its shell, and record the exact location of the release. I take turtle weighing very seriously. It is also Friday...my day to wear ugly shirts. 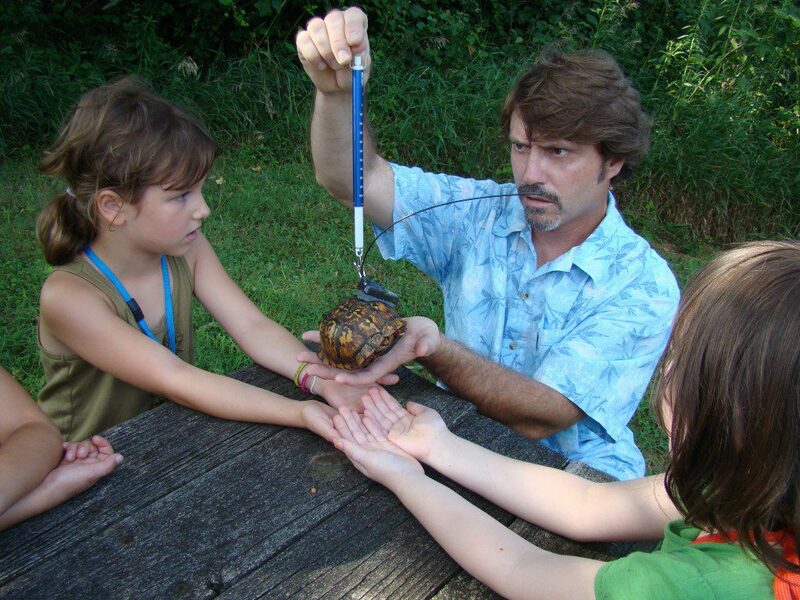 The Box Turtle is measured prior to its release back into the wild. Over the next few years, we will be able to track this turtle and see if he has grown in size or if his weight fluctuates. Students of all ages will be able to enjoy finding a wild animal and learning about its known history. We will even determine where it hibernates for the winter. According to Nate, Box Turtles like this one usually live within a 2 or 3 acre tract of land their entire lives. This turtle has been in the same general area for 15 years, so chances are that it won’t leave. The Shell Sleuths camp gets ready to release the Box Turtle back to his home. Here is a close-up of the transmitter. 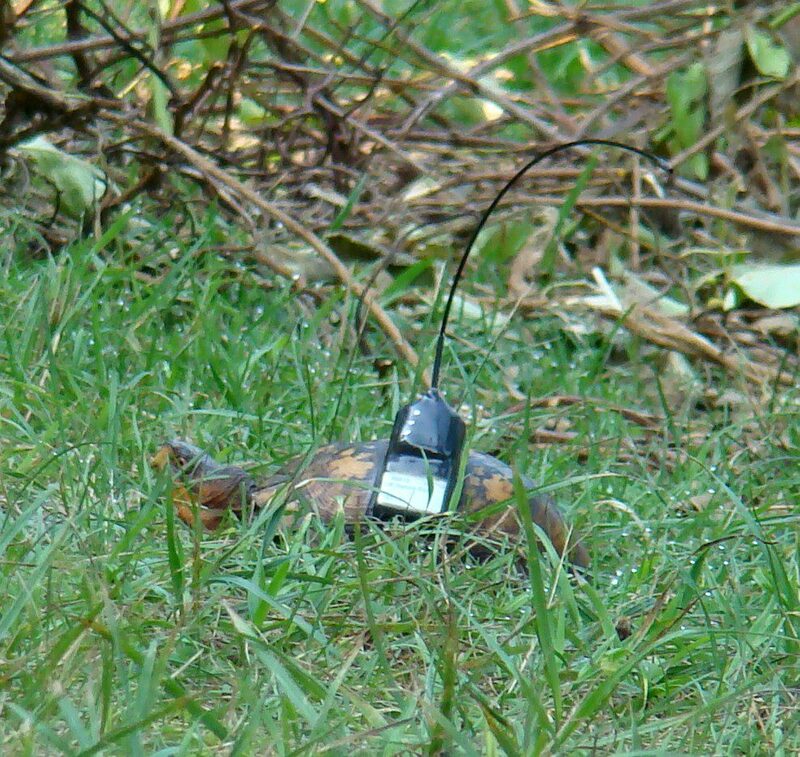 Thousands of turtles across the country have worn this type of transmitter and it does not interfere with their daily lives. Turtles we have tracked in the past have made us wonder what is going on. 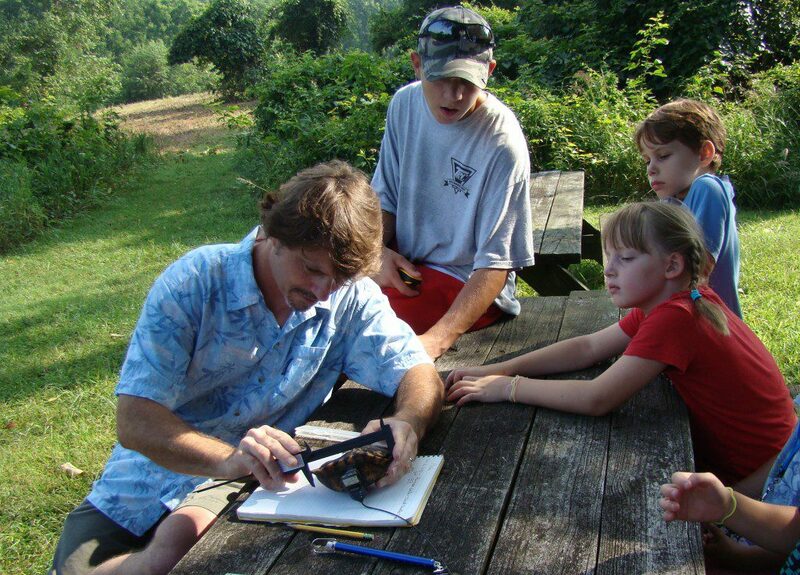 In 2004, one of our summer counselors found a Box Turtle by the parking lot at Ashland Nature Center. We decided to put the transmitter on it. For a month, it stayed at Ashland. We hadn’t checked it in a week, and when we did, we found that it had left the property and walked a mile to the southeast. We kept the transmitter on it and tracked it for another two weeks. It kept going in the same direction and ended up two miles away from Ashland near Hoopes Reservoir. We returned the turtle to Ashland and let it go again. Over the next week, we found that it left the property and was going in the same direction! Since Box Turtles usually don’t travel this far, we surmised that someone found the turtle elsewhere, and let it go at Ashland. The turtle might have been trying to get back home. High school and college students have tracked our turtles over the years for various science projects. Let us know if you are interested in doing this for an academic purpose. Also, look for turtle programs that we offer from time to time if you would like to go turtle tracking! A female Regal Fritillary rests briefly on a yarrow plant at Fort Indiantown Gap. Image by Derek Stoner. While soldiers train nearby to help in the fight for freedom, we wander along the carefully mowed fields amidst vast meadows ablaze with the colors of black-eyed susans, bull thistle, butterflyweed, yarrow, monarda, and other wildflowers. Our eyes scan back and forth for the winged creatures that visit these flowers in search of nectar. The flowers are seeking the same thing we are: butterflies. 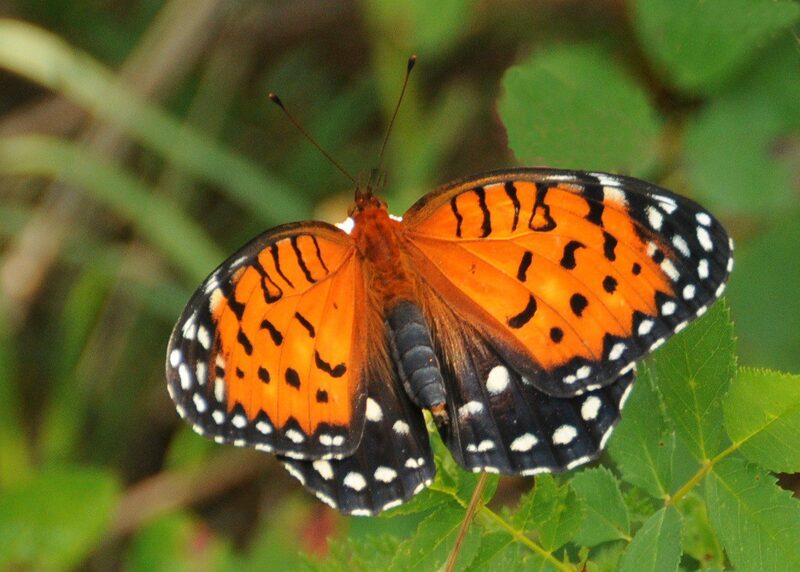 In this unique location, one special butterfly is the attraction: the Regal Fritillary. 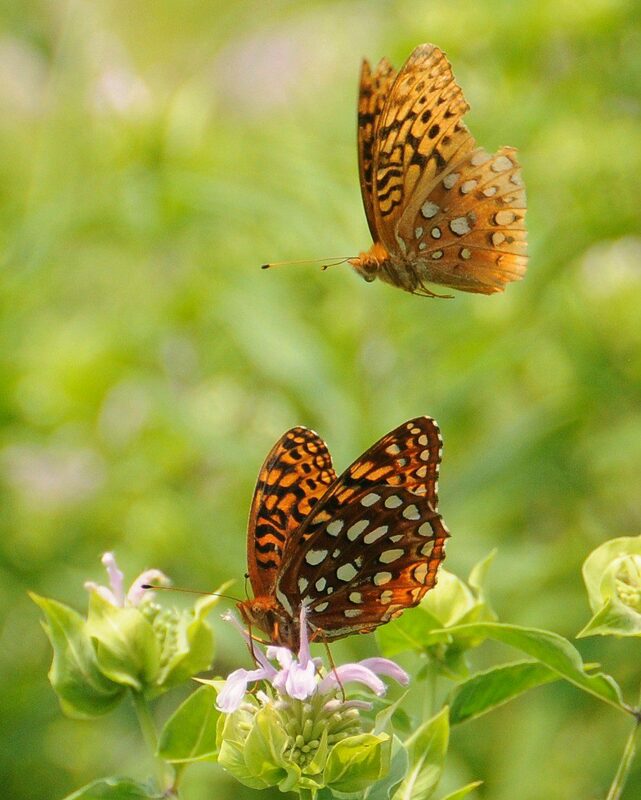 A Great-spangled Fritillary glides above a male Regal Fritillary nectaring on Monarda. Image by Derek Stoner. These gorgeous butterflies have a discerning taste when it comes to choosing habitat: weedy fields in poor soils that have plenty of violets, the host plant for the Regal Fritillary. And not just any field will do, as these butterflies thrive in areas of disturbance. A field that burns every few years spurs re-growth of violets and favorite nectar sources(thistles and milkweeds). Where do you find such habitat? At a military training ground, of course. The sign says it all: You may want to watch your step while searching for butterflies. Image by Derek Stoner. For the third year in a row, the Delaware Nature Society led a trip to Fort Indiantown Gap in Pennsylvania. 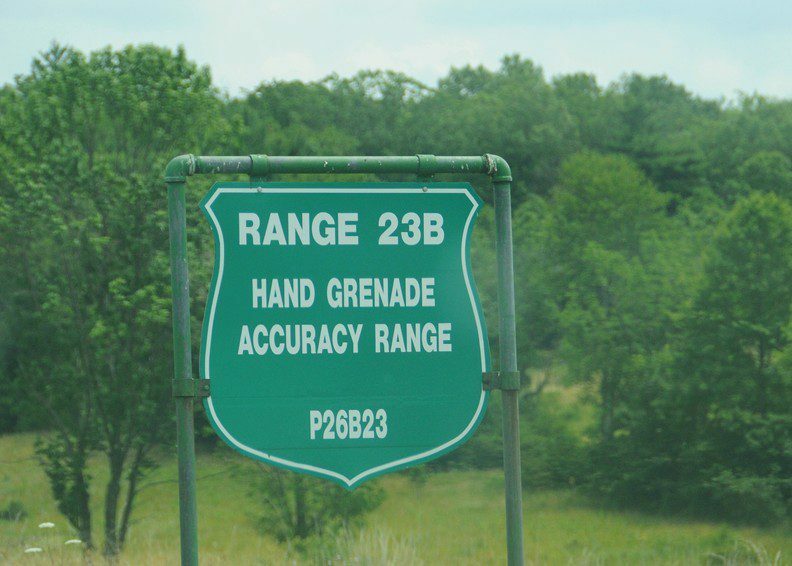 For several days each summer, this National Guard training base opens to the public for tours of its very special treasure. Naturalists from the Fort led an assemblage of more than a hundred curious folks eager to see these winged wonders. Amidst firing ranges, rusting battle tanks, ripped parachutes hanging in trees, and the multiple hand grenade training areas, we tiptoed along the trails in search of the rare Regals. We saw plenty of Regals– likely 50 or more individuals out of an estimated population of more than 1,500 at the base. That’s the largest single population of this insect in the entire world! 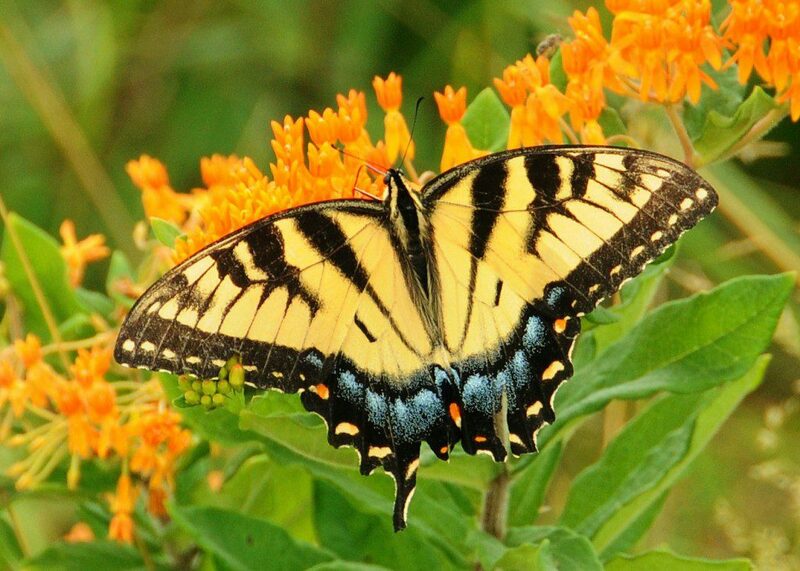 The Delaware state butterfly, the Tiger Swallowtail, is just one of the 81 species of butterflies documented at Fort Indiantown Gap. Image by Derek Stoner. The intensely-managed and altered habitat at the Fort attracts a diversity of insect species, and our group identified 25 butterfly species during our visit. In the vibrant meadows we found other fritillary species like Great-spangled and Variegated, along with other beauties like Bronze Copper, Common Wood Nymph, Zebra Swallowtail, and Pearl Crescent. If you are interested in butterflies join Delaware Nature Society staff member, Sheila Vincent on the program Butterflies for Grownups, Saturday August 7, 1:00 – 4:00 p.m. Additionally, if you would like to help with a special citizen science project, we invite you to join us for the annual Butterfly Count sponsored by the North American Butterfly Association. This year’s count will be held on Saturday, July 31, beginning at 9:00 a.m. Armed with nets, cameras, and notebooks, we will document all the butterflies we can find (and identify) at Ashland Nature Center and Burrows Run Preserve. To register for this free event, contact Sheila Vincent at 302-239-2334, ext. 125.